We are thrilled to announce that Lily-Mae Evans, Kitty Peterkin and Savannah Read will join Emma Moore in the title role of Matilda Wormwood from 12 September 2017. 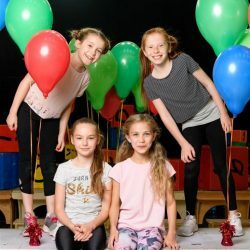 To mark the arrival of the new children’s cast, a video has been released today of the four young actresses as they take to the floor at Pineapple Studios, under the tutelage of Rebecca Thornhill, who plays Matilda’s mum and bi-annual international amateur Salsa and Ballroom Dancing Championship competitor Mrs Wormwood. The show’s forthcoming cast change will see Lily-Mae, Kitty, Savannah and Emma join the recently announced new adult company, which includes David Shannon as Miss Trunchbull, Gina Beck as Miss Honey, and Tom Edden and Marianne Benedict as Mr and Mrs Wormwood. The other young performers announced today join the London company in the three teams who play the roles of Bruce, Lavender, Amanda and the rest of the pupils at Crunchem Hall and are as follows: Bill Bekele, Joe Butler-Smith, Omar Cain-Francis, Halle Cassell, Lucy Cheesman, Liberty Greig, Lauren Henson, Callum Hudson, Vaidile Jonikas, Mia McLoughlin, Miller Morris, Palmer Newson, Rocco Peacock, Lottie Refet, Finn Richards, Martin Soosaipillai, Will Tarpey and Alex Wenham. They join Jessica Chalmers, Hari Coles, Archie Durrant, Sebastian Harry, Tori Louise Ryan, Tilda Marriage Massey and Kacy O’Sullivan who will continue in their roles as pupils at Crunchem Hall. The full adult cast includes Keisha Amponsa Banson, Richard Astbury, David Birch, Maria Graciano, Karina Hind, Peter Houston, Katie Lee, Vicki Lee Taylor, Kris Manuel, Bryan Mottram, Tom Muggeridge, Emma Robotham-Hunt, Simon Shorten, Biancha Szynal, Callum Train and Robert Tregoning. Seen by over 7 million people across more than 60 cities and playing more than 5400 performances worldwide, Matilda The Musical is now preparing for its first UK and Ireland tour, beginning in March 2018, and running alongside the continuing West End production. Winner of 86 major international awards, including 16 for Best Musical, the hit show is now the longest running production to play at the Cambridge Theatre.